This Kid O Shape Sorting house is beautiful, simple, and to the point, which makes it easier to focus on. It’s perfect for learning colors and shapes, matching, and sorting. This magnetic tram set by Tegu is super cute and engaging. It provides little kids with a sense of accomplishment as they connect the magnetic pieces on their own to create the train cars. Playing with magnetic pieces also helps build hand strength, coordination, and motor skills. Dimpl is a super fun on-the-go fidget toy for toddlers (and older kids). The buttons feel soft and rubbery, and promote finger isolation and strength as kids push them back and forth. Dimpl is also a great way to teach cause and effect, and encourage active play. This 6 piece plush bowling set by Gund is super cute and beautifully made. It encourages interactive play, eye-hand coordination, problem-solving, and teaches cause and effect. Unlock each garage with the matching key then push the buttons for the cars to drive out. This is awesome for promoting sustained attention, working on eye-hand coordination and matching, encouraging finger isolation, and teaching cause and effect. Love this toy! These musical instruments are also stacking blocks. The set comes with a drum, a mini xylophone, a mini cymbal, a mini guiro, and a solid blue block. This is a great toy for promoting pretend play, learning cause and effect, and developing coordination. Stack and balance the Fox and Elk then move around the beads on the maze to keep everything balanced. I love finding bead mazes that are are not super busy because it makes them easier to focus on. This toy is great for working on attention, visual scanning, fine motor skills, problem-solving, and so much more. Insert the coins into the piggy bank and listen to over 40 sing-along songs and melodies. Laugh and Learn Piggy Bank teaches cause and effect, promotes motor skills, coordination, and attention. 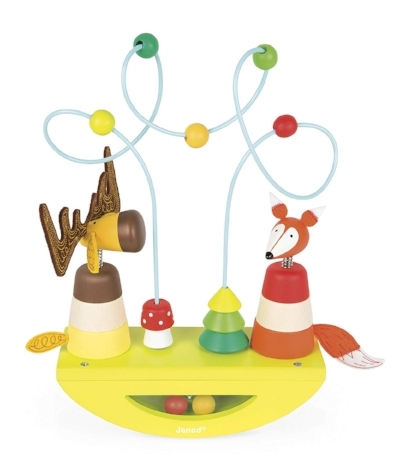 I love this pop up toy because it encourages active play, teaches cause and effect, and helps develop finger isolation. It’s also super fun and engaging to watch the pegs pop up. Pop Blocs Farm Animals encourage kids to use two hands together, help develop coordination, and teach matching skills. 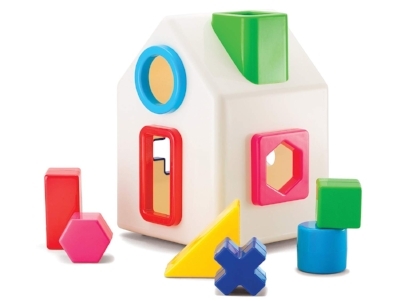 Playing with this toy also promotes attention and problem-solving as a child tries to connect the correct pieces together. This simple but super fun bath toy by Boon encourages visual attention, helps develop eye-hand coordination, and promotes self-esteem (as kids scoop and catch the pieces with the net). Love it!